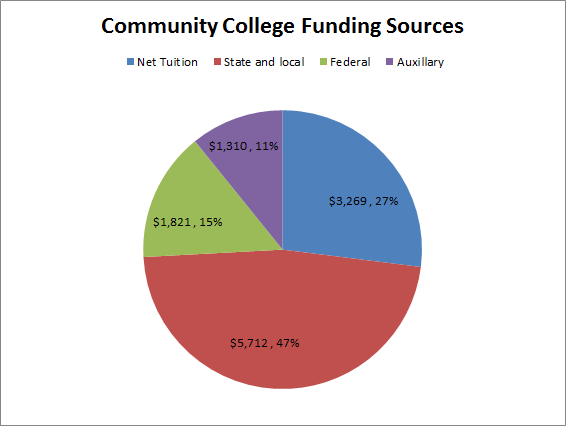 Where Do Public Community Colleges Get Their Revenue From? The recent suggestion by the president that the government make community college tuition free to everyone has generated some discussion on community college funding. Delta cost project has details on revenue sources for colleges at various levels like public, private and community college. Figure S2 in the report covers public community college revenue sources for 2000 to 2010. As you can see most of the money is from the state/local level and a pretty high percentage is from net tuition. Of course this is going to vary a lot across the nation. Some schools have relatively low tuition rates and end up with a higher percent of the money coming from the state or local level. The chunk of revenue from the axillary category will probably vary tons as well.